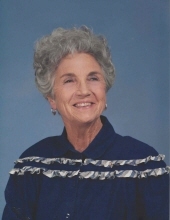 Alice Jane Moon, 90 of Breckenridge, passed away peacefully on March 21, 2019. Family is welcoming friends at the Melton-Kitchens Chapel Monday, March 25, 2019 at 11:30, prior to the service. Funeral service will follow visitation at 1pm at the Chapel of Memories. Arrangements are under the direction of Melton-Kitchens funeral home. She eloped and married her longtime friend and love, James Alton Moon on November 2, 1946. He preceded her in death in 1979, along with her parents, brothers; Morris Wayne Nichols and John Roe Nichols. Alice was dedicated mother, sister, aunt, grandmother, great grandmother and friend. She treasured her family and embraced every moment with them. She loved to cook, kept an immaculate house, created beautiful works of art with knitting needles and crochet hooks, and enjoyed outings to visit friends. She was a homemaker until her husband passed and then she worked at First National Bank in Breckenridge, Texas until she retired. Upon retirement she served her community as a regular volunteer as a “Pink Lady” at Stephens Memorial Hospital. Alice also worked for a short time as a greeter at Walmart. She was a Sunday school teacher at Rose Avenue Baptist Church for many years. She later became a member of Lakeside Baptist Church. Alice is survived by her son, Charles R. Moon and wife Janet, daughter, Linda Katherine Whitley and husband Randy, brother, Joseph Ben Nichols, sister, Gloria Joy Howe, grandchildren; Jamie Whitley, Jennifer Kinkade and husband Jim, Charles W. Moon and wife, Valarie, Jeremy Moon and wife, Alichia, Lesa Feltz and husband, Michael, Jena Moon, great grandchildren; Trystin Kinkade, Alton Moon, Jake Whitley, Abigail Moon, Emma Moon, Luke Feltz, Winston Feltz and Luke Whitley. All of these family members she loved and touched deeply. She will be dearly missed forever in our hearts. Memorials contributions can be made to the Meals on Wheels of Breckenridge and may be left at Melton-Kitchens Funeral Home. Condolences may be made online at www.meltonkitchens.com. "Email Address" would like to share the life celebration of Alice Jane Moon. Click on the "link" to go to share a favorite memory or leave a condolence message for the family.